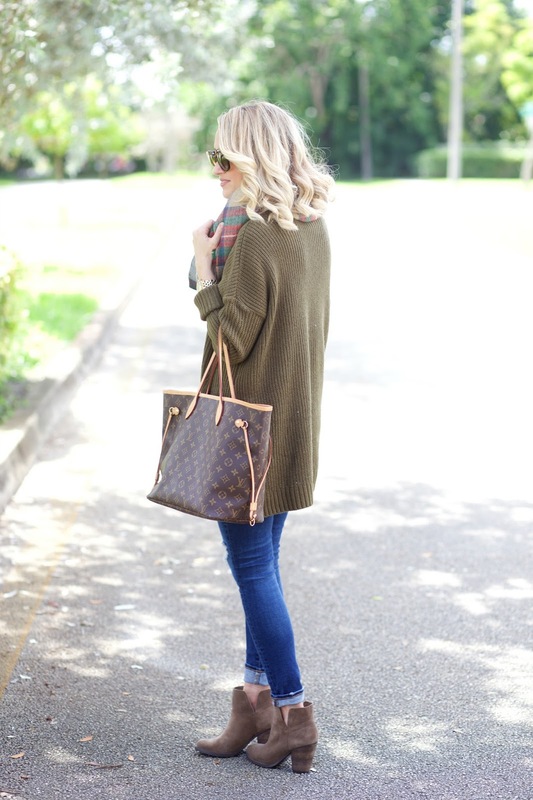 I love this oversized sweater! It is so cozy and I love it paired with my favorite blanket scarf. Have you guys shopped the Shopbop sale? So many great things are included. I ordered these Hunter boots. I think I have gotten almost all of my hunter boots from this sale. They hardly ever go on sale so I always take advantage because I love my hunter boots and they are such a good price! I also ordered a new pair of AG Jeans. They are my absolute favorite jeans so I took advantage of the great price and ordered a new pair. We are going to my brother in laws wedding in New York in two weeks and I still don't have a dress! It's black tie so I need a formal dress! Nothing like waiting until the last minute. I was thinking of using Rent the Runway but I have never gotten a dress form them before. If any of you have used them before I would love your feedback. I am not really sure how it all works or if it would work for me. On another note. Just when I thought Lincoln was never going to sleep through the night last night he did! He went to bed at 8 and slept until 6! I felt like a new person getting a good nights sleep! Lets hope he keeps this up! I hope you all have a great weekend! Thanks for stopping by. 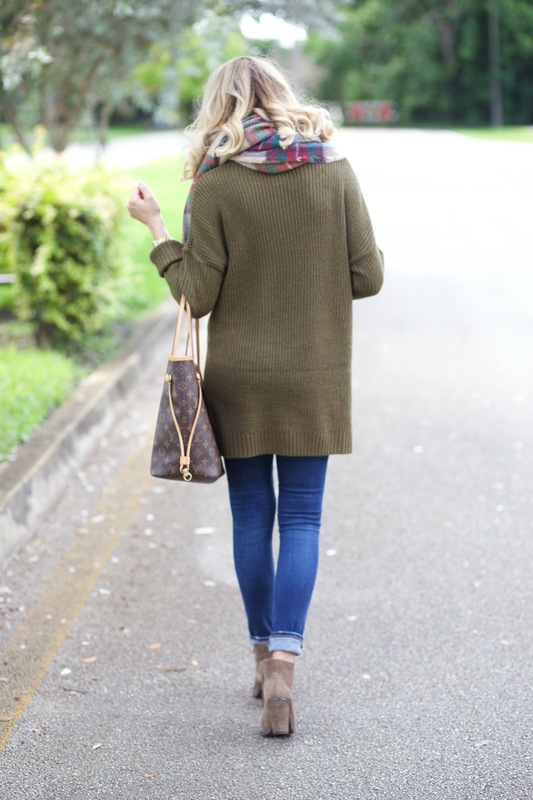 Fantastic outfit for Fall, you're looking gorgeous! I like your chunky sweater and scarf very much! I love rent the runway. I always take advantage of the free backup size they offer, and you can add a second style for like $32. The customer service is great too. I usually try and have my stuff delivered 2-3 days prior and return it the next day on a 4 day rental. That way in case something goes wrong they can sometimes overnight it. I find the reviews and pictures really helpful when choosing sizes (or needed double sided tape). For me I always search for my size/date available and select petite under body type, as some dresses come in petite lengths. Have fun!!! You will love it. Rent the Runway is great! I've used it multuple times before. You're able to see what styles are available for your selected dates (I also usually rent it for 4 days). You get to pick 2 sizes of the same dress so that way if your normal size doesn't fit you still have a back-up. They give you all the stuff to mail it back so it's super easy. It's such a great way to wear a super expensive dress (especially for a black tie event where you'd probably never wear the dress again anyway) for an affordable price! I can't say enough good stuff about RTR! They have such a fun collection of dresses and they do a great job at making sure you are completely happy with your rental! I do unlimited and can't recommend it enough because I was/am always the girl who wants something special for every event and this allows me to do it within budget. Try it! You won't be disappointed! Rent the runway is great. I tried on a dress at their Chicago store and ordered it for my friend's wedding. It was supposed to be floor length but was too short on me (I'm 5'11") I was able to swap the dress out for the one I tried on in store. I'd honestly use it all the time if I wasn't so concerned about dress lengths. Some of the short dresses look like they'd be too short on me but fortunately people post pictures and their height which I use to gauge if the dress will fit me. I'm generally not too concerned about picking the right numerical size. Just peruse the reviews. I love oversize sweater too! 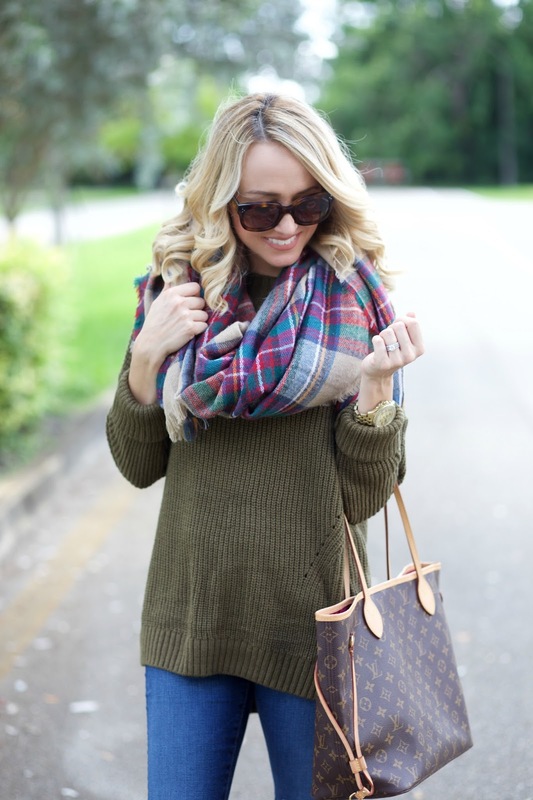 :) Olive and plaid looks great together! Another awesome outfit! :) TFS!